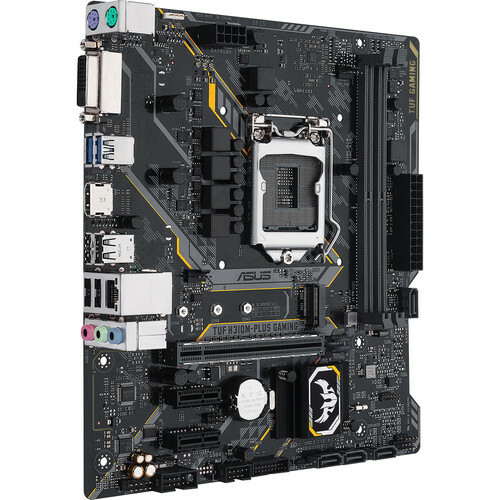 Powered exclusively by 8th Generation Intel Core processors, the TUF H310M-Plus Gaming LGA 1151 Micro-ATX Motherboard from ASUS supports the Intel H310 chipset and the LGA 1151 socket. It is designed for 24/7 performance in micro-ATX cases and is compatible with DDR4 memory, plus HDMI and VGA display outputs. Unlock your system's full potential with SafeSlot and Fan Xpert, while M.2 and Gigabit LAN maximize connectivity and transfer speeds. TUF components provide enhanced system durability and this motherboard is protected by a limited 3-year warranty. Designed exclusively for 8th generation Intel Core processors to maximize connectivity and speed with dual M.2, Gigabit LAN, and Intel Optane memory compatibility. Fan Xpert provides advanced fan and liquid cooling controls for dynamic system cooling and management. Aura Sync RGB lighting with an additional 4-pin RGB header features vast spectrum of colors with the ability to synchronize effects across an expanding ecosystem of Aura Sync-enabled products. Limited 3-Year warranty for reliability built on military-grade engineering. Box Dimensions (LxWxH) 10.6 x 10.3 x 2.2"